I was just talking with a friend of mine the other day, Damon Day; and he was mentioning that he is seeing more and more folks all across the country, who have attended these unaccredited schools and carrying an enormous amount of student debt. I mentioned to him that I’ve already been in the bankruptcy court rodeo over private student loans that do not even qualify as an education loan under the Bankruptcy Code. In In re Schwartz, the court granted summary judgment in favor of the debtor to discharge their private education loan on the grounds that it was not a “qualified education loan” under the Bankruptcy Code. Another recent case came down in April, In re Decena, No. 15-72903; Decena v. Citizens Bank, Adv. no. 15-8275, 2016 WL 1371031 (Bankr. E.D.N.Y. Apr. 4, 2016), in which a New York woman won her bid to erase $160,000 in education related debt after a bankruptcy judge concluded that private loans to attend a foreign, unaccredited medical school do not qualify as nondischargeable student loans under bankruptcy law. The court analyzed both the “educational benefit” and “qualifed education loan” sections under 11 U.S.C. 523(a)(8). a. The debt must be incurred “by a debtor who is an individual”, per 11 USC 523(a)(8)(B). b. The debt must be “incurred solely to pay qualified higher education expenses”, per 26 USC 221(d)(1) by cross-reference from 11 USC 523(a)(8)(B). Mixed used loans, such as credit card debt or home equity loans, are not eligible, per example 6 of 26 CFR 1.221-1(e)(4). 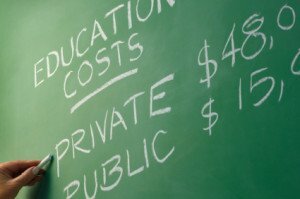 Even education loans are not eligible if they are incurred to pay for expenses other than qualified higher education expenses. c. The debt must be incurred on behalf of a student who is either the debtor, the debtor’s spouse, or the debtor’s dependent (eligible to be claimed as an exemption on the debtor’s income tax return, per 26 CFR 1.221-1(b)(2)) at the time the indebtedness was incurred, per 26 USC 221(d)(1)(A) by cross-reference from 11 USC 523(a)(8)(B). d. The debt must be “paid or incurred within a reasonable period of time before or after the indebtedness is incurred”, per 26 USC 221(d)(1)(B) by cross-reference from 11 USC 523(a)(8)(B). The regulations at 26 CFR 1.221-1(e)(3)(ii)(B) provide for a safe harbor of 90 days before or after the academic period to which the expenses relate. It is possible that a longer period of time would still be considered reasonable based on the relevant facts and circumstances, per 26 CFR 1.221-1(e)(3)(ii), but use of a loan to pay for a previous year’s school charges would generally not qualify unless there were extenuating circumstances. e. The debt must be “attributable to education furnished during a period during which the recipient was an eligible student” per 26 USC 221(d)(1)(C) by cross-reference from 11 USC 523(a)(8)(B). To be an eligible student, the student must be enrolled at least halftime in a Title IV institution and be degree-seeking. Study abroad is only eligible to the extent that it is approved for credit by the home institution. In the Decena case, the judge determined that the debtor attended an unlicensed and unaccredited medical school not found on the Federal School Codes List for the school year attended. What this means is that if you’re wondering whether you attended an unaccredited school, a simple google search using the terms, “Federal School Codes List” followed by the school year you attended, you’ll see the entire list of eligible schools. If you find your school on that list, then it was accredited at the time you attended and you would NOT be eligible to discharge your education loans under this section of the Bankruptcy Code. However, if your school is NOT on the list, then it might be worth exploring your bankruptcy option to discharge your legal obligation to repay that debt. He concluded that since Congress specifically mentioned loans in Subsection 523(a)(8)(A)(i), but not 523(a)(8)(A)(ii), it intended to refer only to conditional stipends, veteran benefits and other cash-benefit programs that are distinct from traditional student loans and therefore found that Decena’s loans satisfied this Section. The future of student loans in bankruptcy will still require an adversary proceeding (a lawsuit) in which the debtors must ask the bankruptcy court to order their student debt obligations discharged in bankruptcy. Finding a qualified bankruptcy lawyer that understands the Rules of Bankruptcy Procedure and litigation will prove more difficult. This means that not only will consumers be required to file a bankruptcy case, they will need to file a lawsuit against their creditors and ask the court to determine each student debt obligation to be discharged. Don’t be discouraged if the institution is accredited because there is still the Undue Hardship bankruptcy discharge that no longer requires a medical condition to satisfy. With more than $1.3 Trillion dollars in student loan debt, we should continue to see more of these bankruptcy cases. Bankruptcy practitioners whose practices have declined since the recession, are being called upon to deepen their skills and broaden the scope of their practices to include a more thorough review of their client’s cases to provide a more complete solution. My request: STOP TELLING CLIENTS THAT STUDENT LOANS CANNOT BE DISCHARGED IN BANKRUPTCY BECAUSE IT’S NOT TRUE!! « Expecting a baby? Did you add estate planning to your to-do list yet?